Jump into the wildlife, history, and scenery of the Canadian Arctic. Choose your own adventure to discover Arctic wildlife, including migratory birds, whales, polar bears, as well as haunting historic sites like the Franklin Graves on Beechey Island. Daily excursions and nearly endless daylight mean there is ample time and ways to explore. Your home on the water is the comfortable Ioffe Akademik. This research vessel and class 2 Icebreaker, built for Arctic waters, can venture where many can’t. Onboard, a small number of guests and large expedition crew ensures each day of your trip is seamless and exhilarating. The Arctic is beautiful from the ocean but the best way to really experience it is with a land excursion. Your expert guides will help you choose adventures to suit your tastes. Keep your camera on hand for endless wildlife sightings. The Arctic is full of unique animals – polar bears, walruses, muskok and more! With a resident photographer on board the ship to assist, you’ll never miss a shot. There are many opportunities to get down to water-level on zodiac excursions, but for the truly adventurous consider adding a small group kayaking program for the length of your tour. Arrive in Edmonton, a northern prairie city east of the Canadian Rockies. Meet your group leader this evening for an information session. Tomorrow you'll be flying north to meet your expedition vessel. Overnight at the Fairmont Hotel MacDonald Edmonton. This grand hotel is heritage landmark overlooking the North Saskatchewan River Valley, within walking distance to Edmonton’s City Hall and the Art Gallery of Alberta. Enjoy luxuriously appointed rooms, fitness centre, spa services, public gardens, indoor pool, and fine dining options. Depart Edmonton on a charter flight to Resolute, a remote outpost above the Arctic Circle. You'll be provided with premium quality outdoor gear required for your time in the Arctic. Your Shackleton Suite onboard the Akademik Ioffe features two spacious rooms, including a lounge area with a convertible sofa, and a bedroom containing a double berth. Your lounge room also contains a large table, writing desk, chair, ample storage and a large window that can be opened. After a charter flight from Edmonton, arrive in Resolute - one of Canada's northernmost communities, and one of the coldest inhabited places in the world. Enjoy a welcome cocktail with your crew of passionate and experienced Arctic experts before the ship weighs anchor and departs Resolute in the early evening. 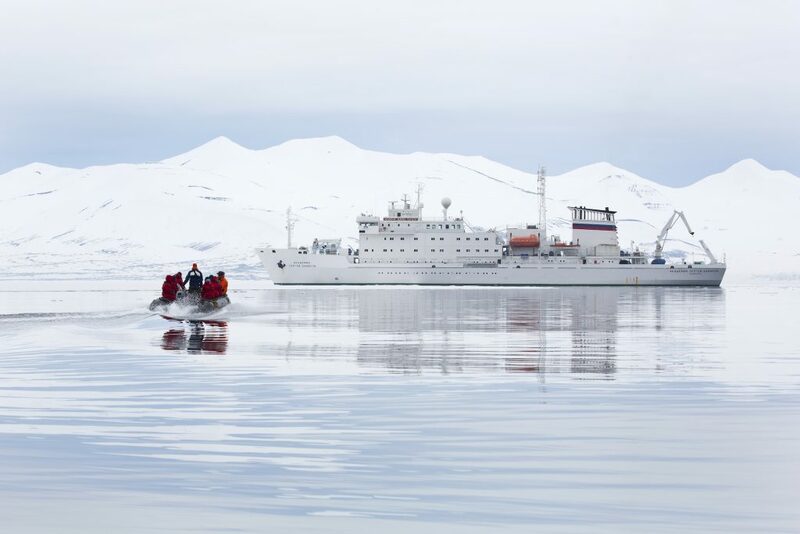 The Akademik Ioffe is a comfortable and agile Arctic expedition vessel. Rated a class 2 ice breaker, her captain is able to quickly change course to follow wildlife - where other expedition ships may get left behind. From small group sessions to briefings for all passengers, public spaces onboard the ship ideally suited for each and every need. A separate lounge and bar with panoramic views, as well as a library provide ideal places to sit and relax or catch up on some reading. Other facilities include a lounge, theater style presentation room, gift-shop, fitness room, massage room, hot water spa, sauna and plunge pool. A large bay on the south coast of Devon Island, Maxwell Bay offers wonderful hiking ashore and wildlife watching from the water. Wake up to the first full day of your trip and get ready to see wildlife up close. The Coast of Devon Island is home to muskox, caribou, as well as polar bears, and harp seals, ringed seals, bearded seals and even walrus have been spotted here. Hiking on shore or viewing wildlife from the ship are both a great way to spend your day. Why not enhance your Arctic cruise with a unique opportunity to kayak into various bays and islands, focusing on wildlife sites, offering paddlers a slower-paced, more exclusive experience. Just a small group of passengers get join in on these excursions, of which there are an average of six or seven planned per voyage.Ask your Sales Advisor about adding this option onto your cruise before it books out. Your voyage continues east through Lancaster Sound along the southern coastline of Devon Island. This area has been named the wildlife ‘super highway’ of the Arctic. The waters of the Atlantic Ocean, Arctic Ocean, and the northern archipelago of islands converge in this area to create bountiful food resources for wildlife. Hiking along Croker Bay, your guide will show you herds of prehistoric-looking muskox. Awe-inspiring icebergs set against the glacial mountain peaks make for stunning zodiac rides, and an abandoned 1924 Royal Canadian Mounted Police (RCMP) outpost makes for great photos. See Nirjutiqavvik National Wildlife Area - home to almost 400,000 seabirds. Taking part in the optional, multi-day kayak program will increase your chances of seeing an elusive narwhal whale! Marvel at colonies of thick-billed murres and northern fulmars as you explore by zodiac and keep a watch out for beluga whales. Grise Fiord is the northernmost community in Canada and one of the most isolated communities in the world. Settled in 1953 by the Canadian government as a sovereignty exercise during the Cold War, the tiny community of Grise Fjord is descended from eight Inuit families. The scenery here is stunning, the wildlife is abundant, and you'll be warmly welcomed by the people. Nearby Craig Harbour is the site of an abandoned RCMP outpost, established in 1922 as the RCMP sought to patrol the north and provide services to the Inuit. Visit and learn about the history of this site as your group hikes and explores the bay and hillsides of Craig Harbour. This superb location is a prime nesting spot for several hundred thousand birds. Located on the northern coast of Bylot Island and within the boundary of Sirmilik National Park, the bird cliffs of Cape Hay are home to thick-billed murres and black guillemots, along with black-legged kittiwakes. The scenery of Cape Hay will take your breath away today, as your eyes gaze beyond the tundra towards the soaring mountain ranges in the distance. This is another great day for bird watching. Your captain navigates the ship into nearby Elwin Inlet, a breathtaking fjord which is well protected and great for a zodiac cruise or hike onshore. Take advantage of several great walking opportunities today, as you explore Cape Charles Yorke. Keep our eyes peeled for polar bears, which are plentiful along this coastline. Having crossed Prince Regent Inlet overnight, your ship approaches the towering bird cliffs of Prince Leopold Island in the morning. The sea ice around Prince Leopold Island is a great place for spotting ringed seals – and polar bears normally appear when there are seals. A unique historical attraction – the James Clark Ross historical site – sits where he and his crew wintered over in 1848, as they searched for the missing Franklin Expedition. Keep your eyes trained on the shoreline, as the shallow gravel beds attract molting beluga whales. Beechey Island holds great historic importance in the story of the Northwest Passage. It is here that Sir John Franklin’s ill-fated expedition spent its last ‘comfortable’ winter in 1845 before disappearing into the icy vastness. The One Ocean team participated in the expedition to locate the lost Franklin ships. The wreck of the HMS Erebus was discovered on the sea bed of the Victoria Strait. Make sure to ask lots of questions! As you visit Beechey Island onshore, you’ll see their haunting grave markers on a remote windswept beach – a sure topic of conversation for tonight’s farewell dinner with the Captain. By morning, you are back at Anchor in Resolute. From here you'll fly back to Edmonton. This morning you arrive in Resolute, where you started your expedition. Disembark the ship via zodiac and you will continue with your group towards the Resolute Airport. A a charter flight brings you back to Edmonton. Say farewell to the north, as you depart from Edmonton and fly home. Ask us about adding a spectacular train journey through the nearby Rocky Mountains to your adventure! This trip is available for departures in August. based on double occupancy, August 2019 departure and our base class. The small guest count and amazing onboard staff meant our off-ship excursions were seamless and exhilarating. I highly recommend the kayaking program…imagine paddling around icebergs!